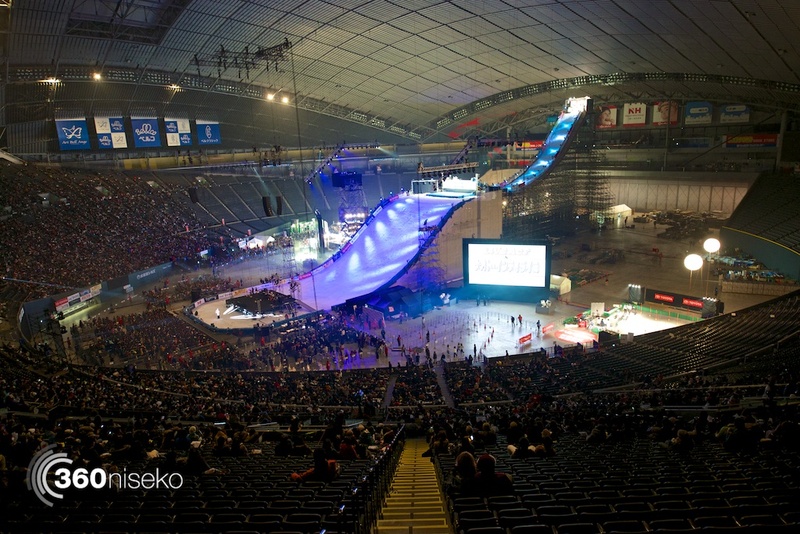 To say that the Toyota Big Air is huge would be an incredible disservice. Just looking at the numbers is mind blowing. 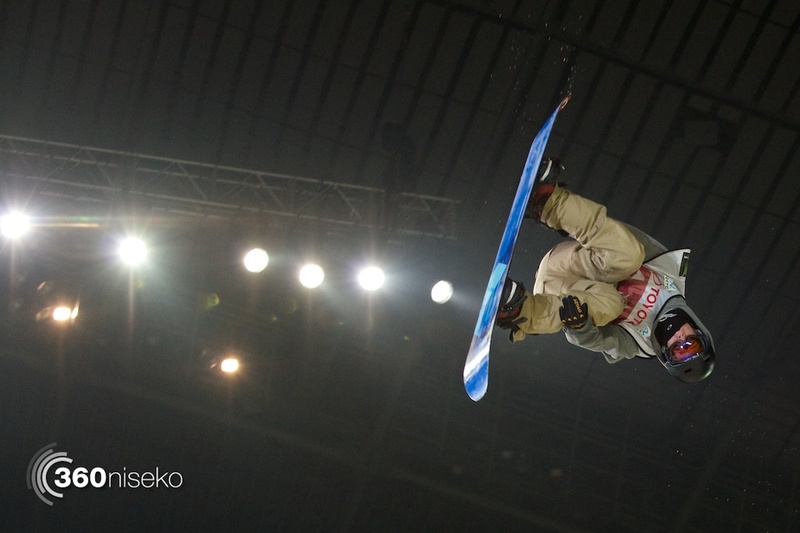 16 professional snowboarders, $100,000 in prize money, 33,000 people in attendance – no doubt fuelled by Sochi Olympics interest. Then there is the jump – 36m high, 45˚ max approach angle, 125m long, 1,000,000kg of steel framing, 250,000kg of snow, 3,000 construction workers – and only five days to put it all together! Then there is the fuzzy area, the grey to the numbers black and white. The riders. 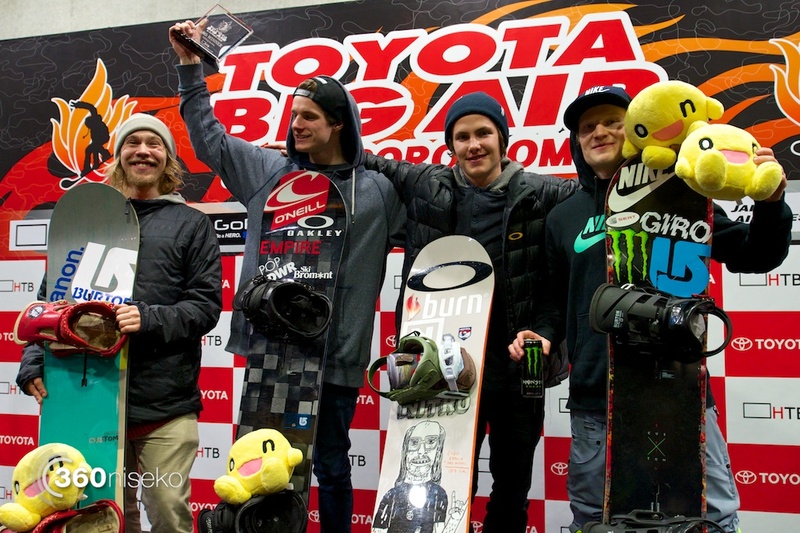 Not only are they all professional riders, but there were multiple Olympic medallists, X-Games winners and previous Toyota Big Air winners all competing for serious recognition (and equally serious prize money). It might not have been an Olympic medal that they were competing for, but that didn’t stop them from doing everything they could to win. 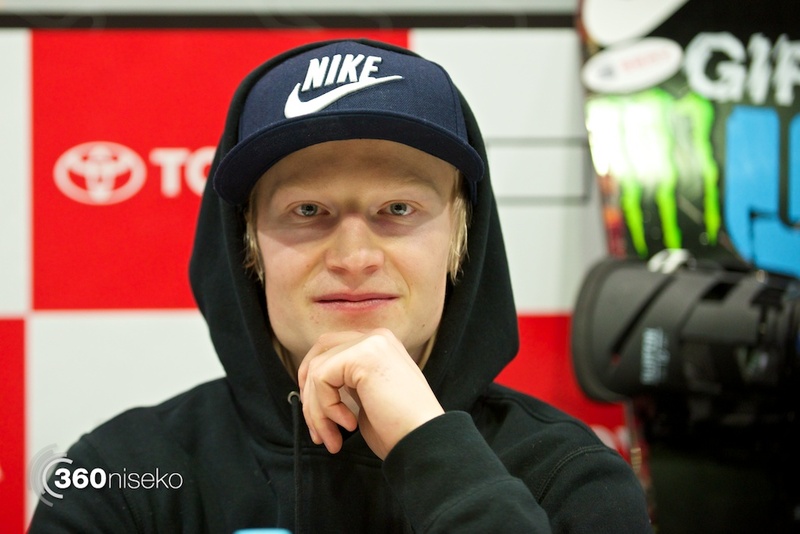 The qualified riders were (in order of qualification): Antoine Truchon (CAN), Toshiki Yamane (JPN), Staale Sandbech (NOR), Taku Hiraoka (JPN), Sven Thorgren (SWE), Peetu Piiroinen (FIN), Yuki Kadono (JPN), Roope Tonteri (FIN), Gjermund Braaten (NOR), Chas Guldemond (USA), Maxence Parrot (CAN), Jin Shimaya (JPN), Tatsuki Inamura (JPN), Ryota Takahashi (JPN), Atsushi Ishikawa (JPN) and Keiji Okamoto (JPN). 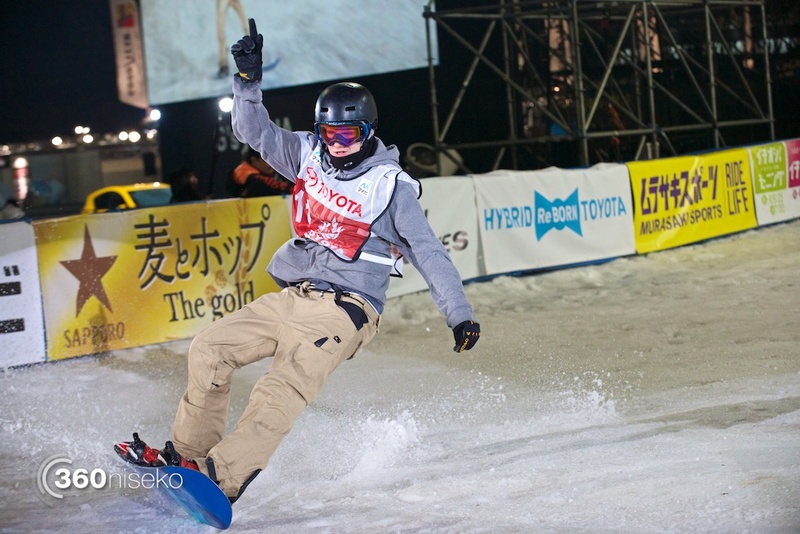 This year was the second time that I had attended the Toyota Big Air, the last time was in 2005 when it was outdoors in Makomanai, on the outskirts of Sapporo. I would go as far as saying it was the coldest I had ever been in my life, and after an hour of extreme discomfort I had zero interest in watching the riders, and even less interest in ever returning in the future. 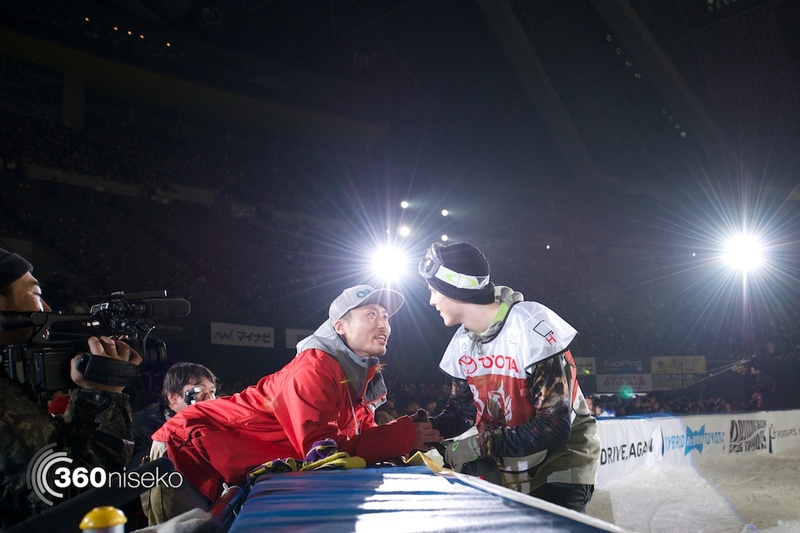 However, the competition moved to its current home inside the enormous Sapporo Dome in 2012, and with it came shelter and most importantly – comfort. 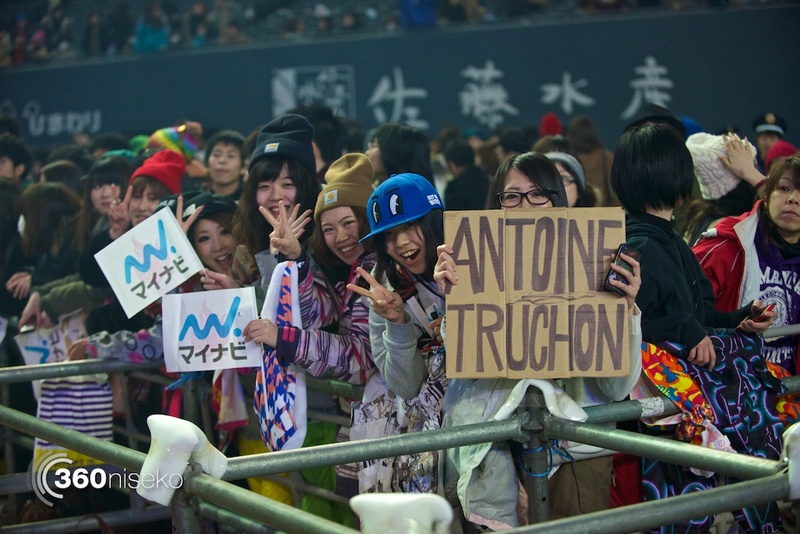 After the excitement of the opening live act died down (Japanese girl group E-Girls, however due to Japanese copyright laws couldn’t be photographed), the riders began their gruelling quest to make the finals. 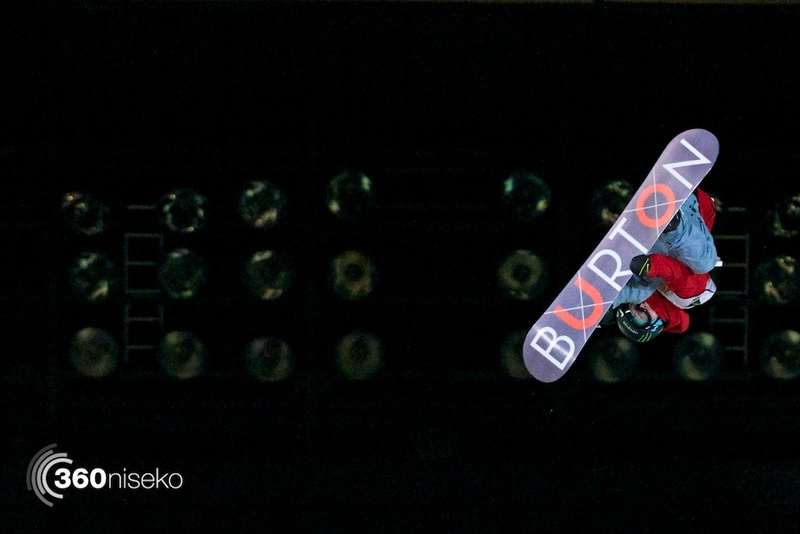 Each of the sixteen riders had two attempts to impress the judges and land a high score. 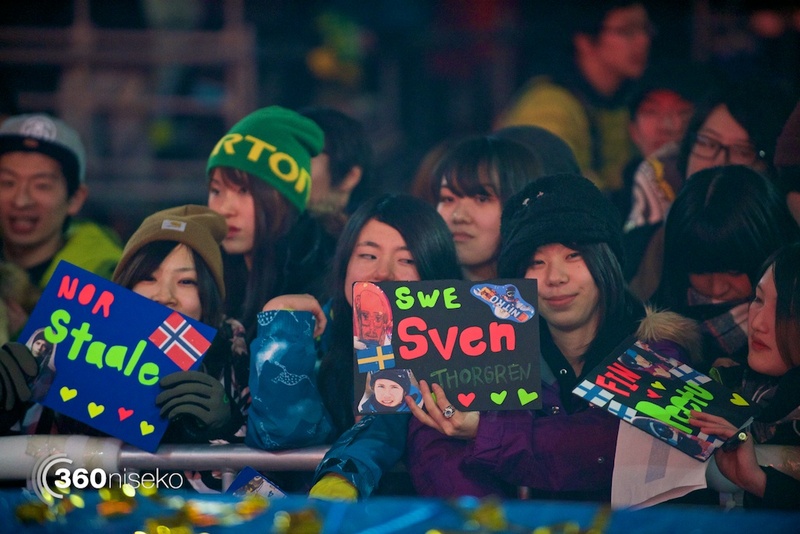 The top eight would make the semi-finals, then the top four would make the finals following the same two-run format. 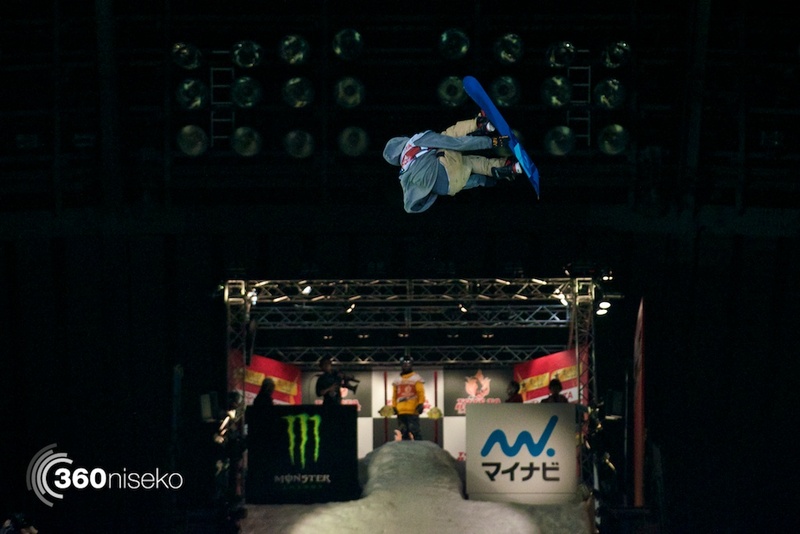 There were some early upset knock-outs, including 2013 Toyota Big Air winner, Antoine Truchon who failed to land cleanly and Sochi Olympics Half Pipe broze medallist, Taku Hiraoka who didn’t seem comfortable pushing the limits and opted for simple (but clean) 360s. 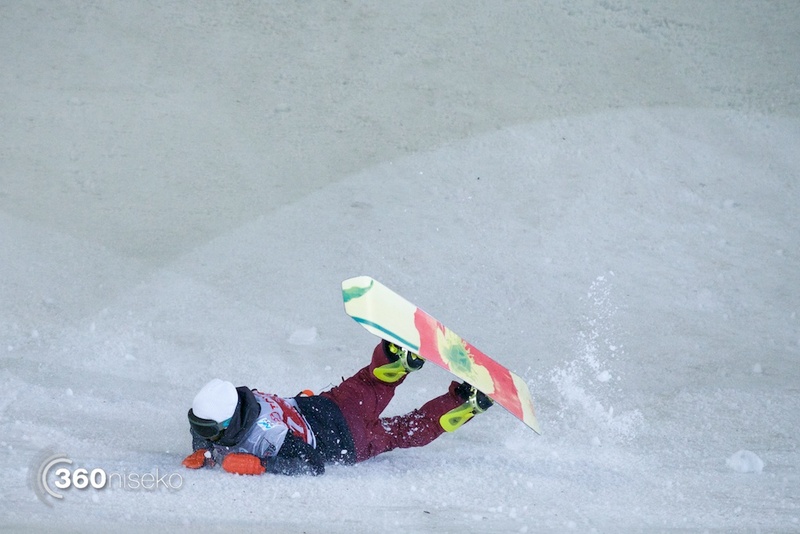 Only two of the eight Japanese riders made it to the semis, and none of them managed to make it to the finals. 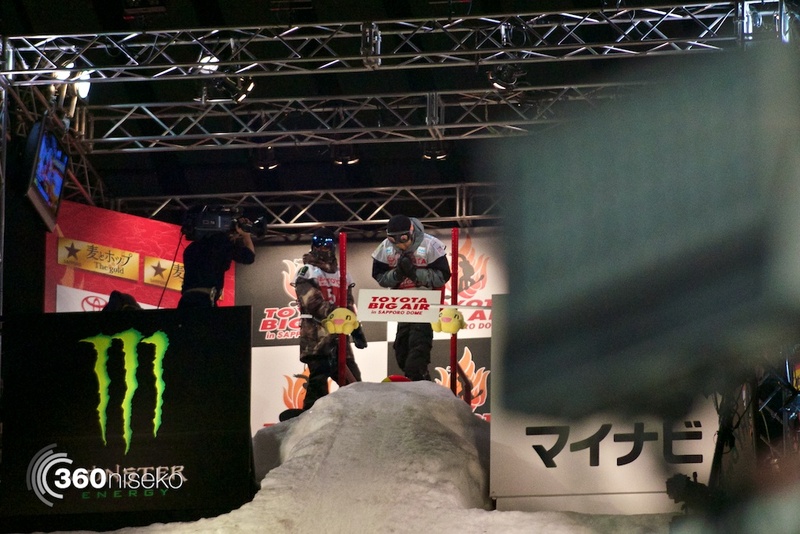 It was lucky that the commentators and judges were able to follow what was happening, as all the riders in the final were doing 1440s (which is four complete 360˚ rotations), all with different elements of corks and grabs to differentiate. 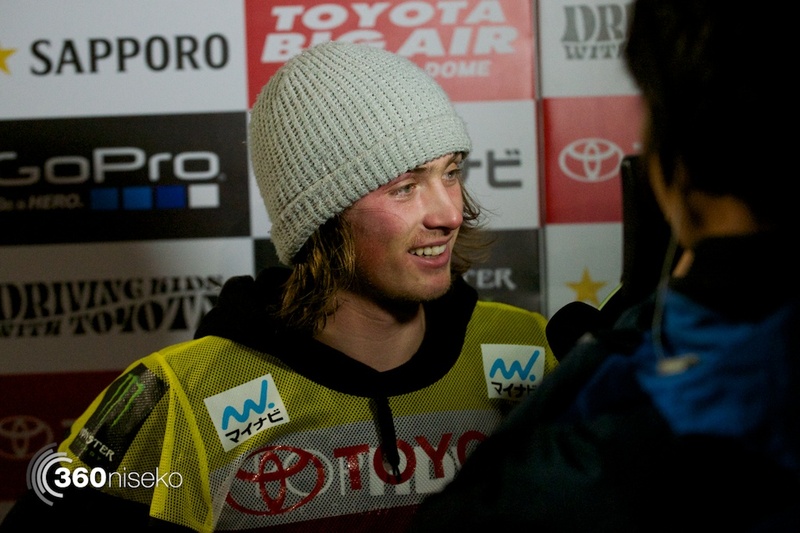 It was dizzying as a spectator – who knows what it must have been like for the riders. 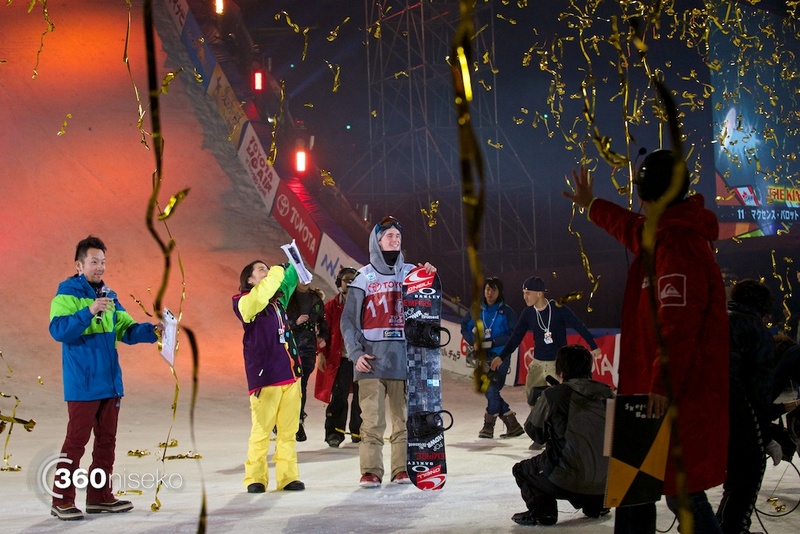 But, in the end, there had to be a winner, and that man was Maxence Parrot from Canada. 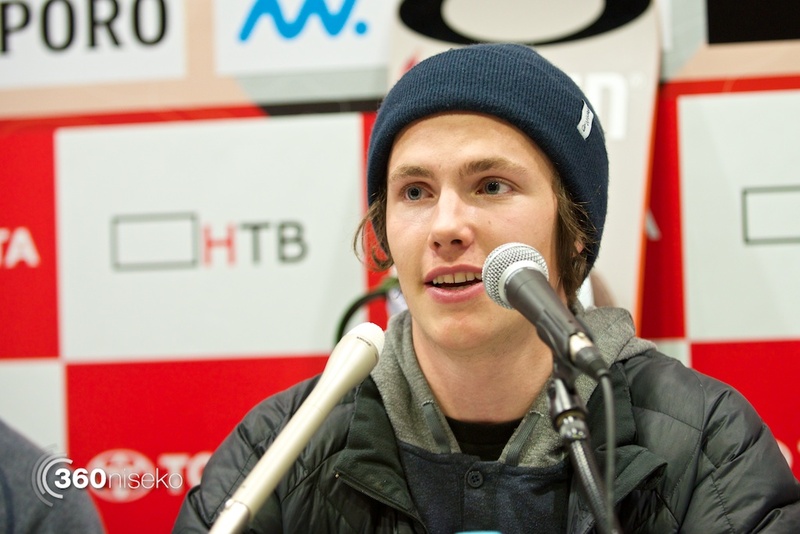 He may have only come 5th in the Sochi Olympics slopestyle event, but he is the current X-Games gold medallist for both the Big Air and the Slopestyle, and he was a class above the rest at this event. 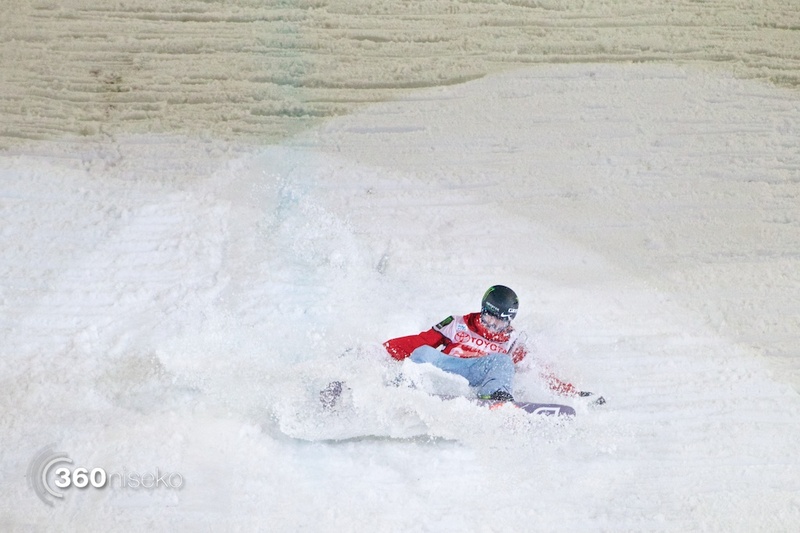 He was consistent, and he was consistently good, finishing with the highest score in each round of qualification. 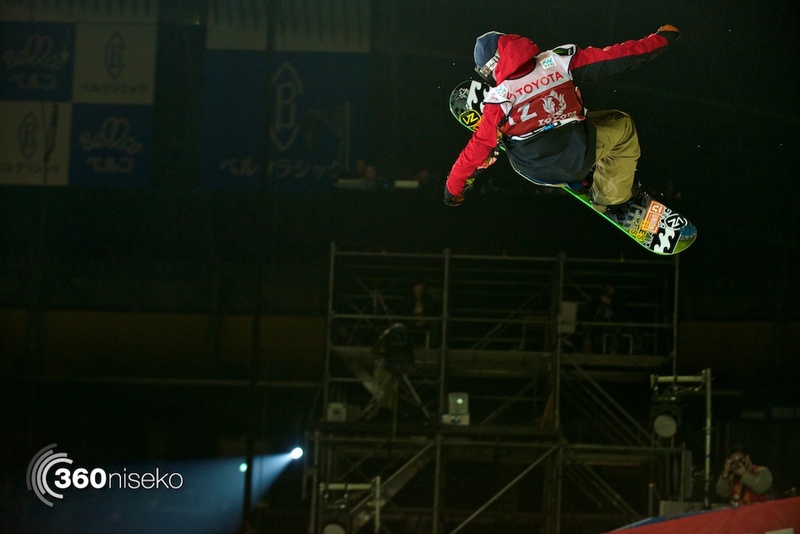 He ended up winning with a Cab Double Cork 1440 Melon, of which makes zero sense to me, but looked incredible. 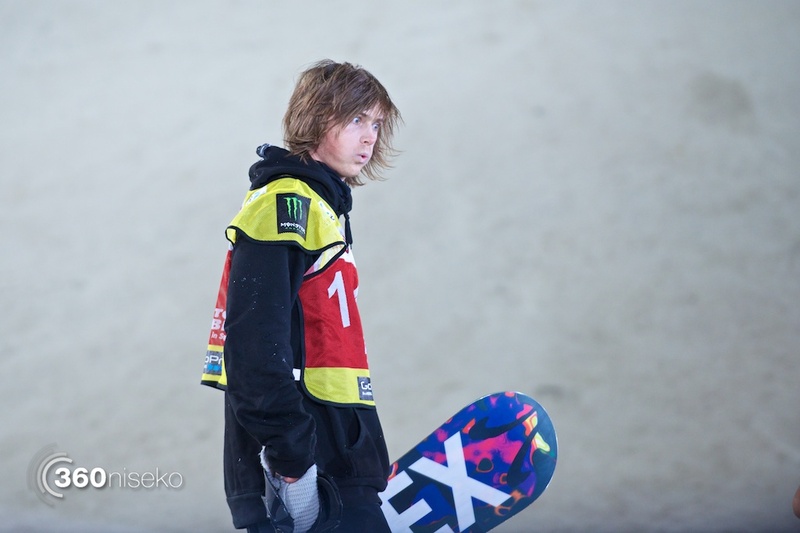 Finnish Roope Tonteri ended up in 2nd place with 91 points after landing his Cab 1440 Mute, and Swedish Sven Thorgren took the final podium place with 60.7 points after a sketchy landing on his Backside 1440 Mute. 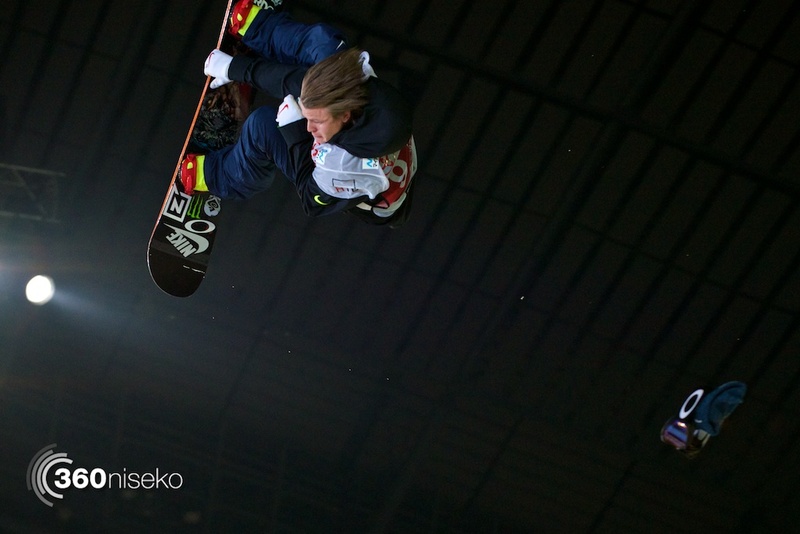 Peetu Piiroinen had a bad series of runs in the final, failing to land his Backside 1440 Mute. The press conference was an eye opener! 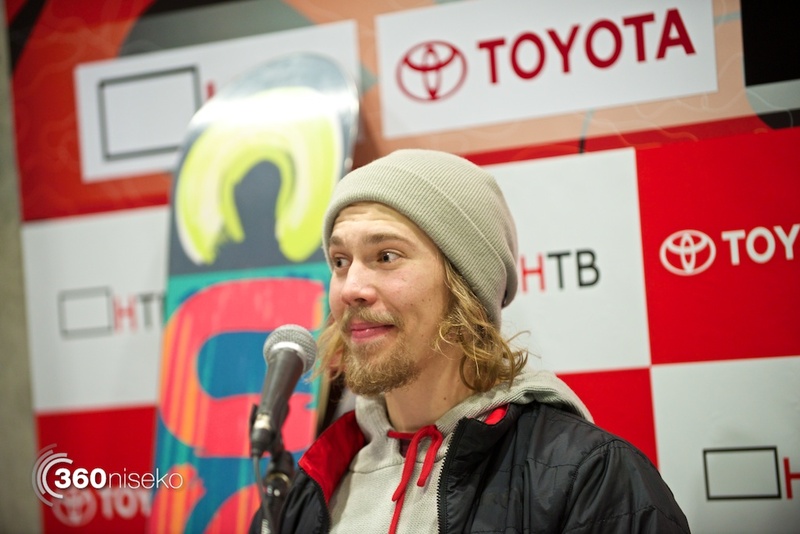 2013 Toyota Big Air winner and crowd favourite, Antoine Truchon was in great shape asking all the important questions of the four finalists. It did make for a more interesting conference than the usual questions about ‘how it felt to win’ – very good, in case it wasn’t clear. 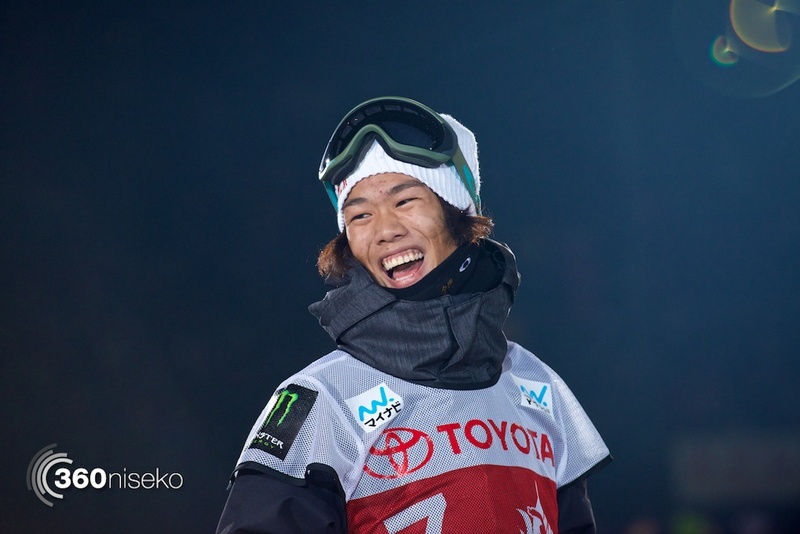 I was lucky enough to be able to ask the finalists a quick question, and that was about where they had been riding while they were in Hokkaido, and their thoughts. Sadly, this time the riders didn’t have time to get to Niseko, however they did have a powder day at Sapporo Kokusai Ski Resort, which they all agreed was the best powder snow they had ever ridden in. They were blown away by the amount of snow in town, but even more so by the waist deep snow in the trees. 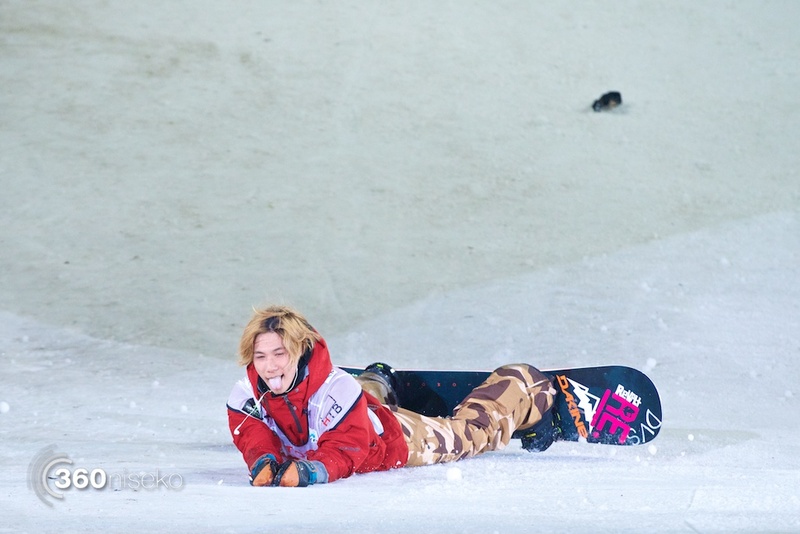 Big love for the Japanese powder snow!